On June 25th, our friends at Solomon Cordwell Buenz (SCB) held a public meeting during which were revealed their plans for a seven-storey glassy addition to the Union Station train station (1925) in the West Loop district of Chicago, a structure originally designed by Graham, Anderson, Probst & White. Developed by Riverside Investment & Development and Convexity Properties, the proposed addition will comprise a hotel, apartments, an office complex, and retail space; if accepted, it would cause an increase in the height of Union Station from 150 to 245′ with 404 apartments to be housed within a glassy rectangular volume on top of the original structure, which would, in turn, house 330 hotel rooms. 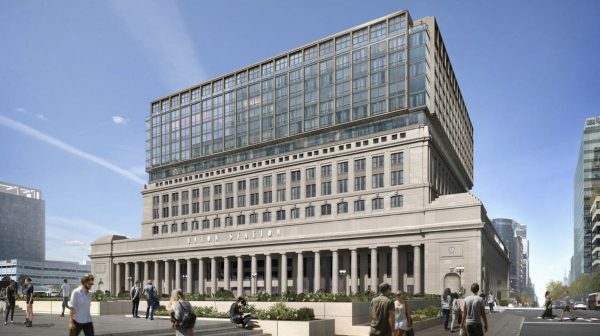 In addition to submission for review by Chicago’s landmark preservation committee,—Union Station has been a Landmark since 2002—the first phase of the development will also require zoning approval and aldermanic (city council) approval. If that’s approved, the second phase will see the construction of an apartment tower above an existing train platform in the immediate proximity of the station.